Mangroves provide an array of ecosystem services, from coastal protection to fishery support to carbon sequestration, all of which are at risk in the Indo-Pacific region due to sea-level rise (SLR). SLR can lead to inundation of these habitats and shoreline retreat. Lovelock et al. (2015) analyzed recent trends in mangrove surface elevation, finding that SLR could be combated when sediment availability allowed for soil-surface elevation gain at a rate that exceeded SLR. However, in 69% of the sites studied, SLR rate was exceeding the rate of soil-surface elevation gain. Lovelock et al. also presented a model based on field data that suggests submergence of forests with low tidal range and low sediment supply as early as 2070. Surface elevation table-marker horizon (SET-MH) technology was implemented to measure changes in soil surface elevation via a “benchmark rod” driven into the soil and connected to a “portable horizon arm” with fixed points that measured the distance to the soil surface. This study used a network of SET-MH stations with records of 1-16.6 years in length. 27 sites were analyzed, taking into account factors like suspended matter concentration and regional rate of SLR based on tide gauges. It was determined that mangrove soil-surface elevation gains are dependent on rates of surface accretion as well as subsurface organic matter accumulation. In addition, the authors found that concentration of total suspended matter was proportional to surface accretion and to surface elevation gains. The areas that experienced higher SLR than surface elevation gain also tended to experience shallow subsidence. 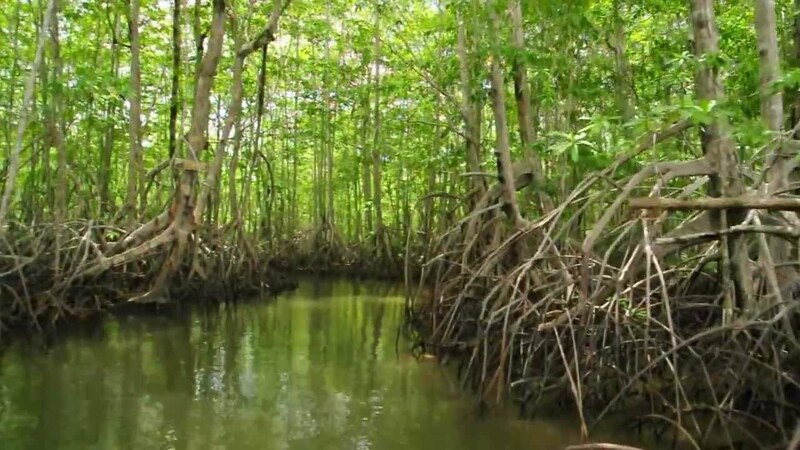 Lovelock et al.’s model analyzed mangrove habitat suitability based on position in the tidal frame, and it was assumed that a forest could not survive below mean sea level. Based on this model, complete submergence of forests was projected in 100 years where tidal ranges are less than 4 m. This finding corresponded to paleo-records of mangrove responses to SLR. Though the model had limitations (it did not take into account many stochastic and localized events), it was valuable in determining under which conditions forest loss is likely and determining locations that would benefit from sediment supply management and space for landward migration. The outlook under a moderate SLR scenario (IPCC RCP6) is bleak for the Gulf of Thailand, parts of Sumatra, Java, Papua New Guinea, and the Solomon Islands with submergence by 2070. The outlook, under the same scenario, is hopeful in areas with larger tidal ranges and sediment supply, including east Africa, the Bay of Bengal, eastern Borneo, and northwestern Australia. Mangrove shoreline retreat is enhanced by human actions like damming and groundwater extraction, which lead to decreased sediment supply and increased subsidence. This study delivers a call to action to maintain sediment supply in areas modified by dams, to reverse forest degradation that lessens organic matter inputs, and to plan for landward migration of forests to higher elevations in places with restricted sediment supply. These actions will contribute to extended viability of mangroves. Lovelock, C.E., Cahoon, D.R., Friess, D.A., Guntenspergen, G.R., et al., 2015. The vulnerability of Indo-Pacific mangrove forests to sea-level rise. Nature 526, 559-563. This entry was posted in Grace Stewart, Sea Levels and tagged Andrew Swales, Catherine E. Lovelock, climate-change ecology, Daniel A. Friess, Donald R. Cahoon, environmental sciences, Frida Sidik, Glenn R. Guntenspergen, Indonesia, International Crane Foundation, Ken W. Krauss, Kerrylee Rogers, Le Xuan Thuyen, Macquarie University, Mangrove Forests, Megan L. Saunders, Ministry of Marine Affairs and Fisheries in Bali 82251, National Institute of Water and Atmospheric Research in Hamilton 3251, National University of Singapore, Neil Saintilan, New Zealand, Ruth Reef, The University of Queensland, Tran Triet, United States Geological Survey, University of Cambridge, University of Wollongong, Vietnam National University by Emil Morhardt. Bookmark the permalink.